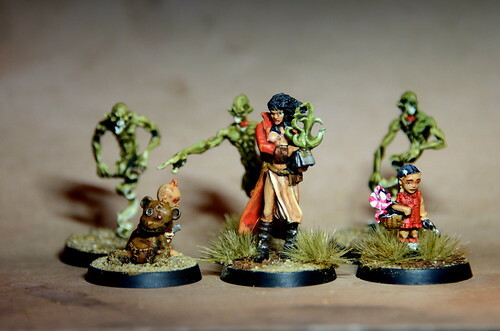 I hadn't tried any of the Malifaux range from Wyrd Miniatures, so figured it was time to put that right, and this little group just called out for some painting action. This is Pandora and her rather creepy entourage of spirits. These were quite fun to paint, and while it was a little weird to be painting metal miniatures again (it's odd how you get into that feeling with resin and plastics, considering that it wasn't all that long ago that most miniatures were metal), I think the models turned out pretty well. I also love how they present the factions over on their website. You can check it out here. No idea how much fun the game itself is, but I do like a lot of the miniatures in their range.